▲ Choirs from around the world will once again converge on Jeju, as the 2008 chorus shown here did, with several public concerts planned, including an open air concert at the Choenjiyeon Falls Outdoor Stage. Photo courtesy Jeju Provincial Govt. Choirs from around the world will lift up their voices in song this July, and they will do it on Jeju. 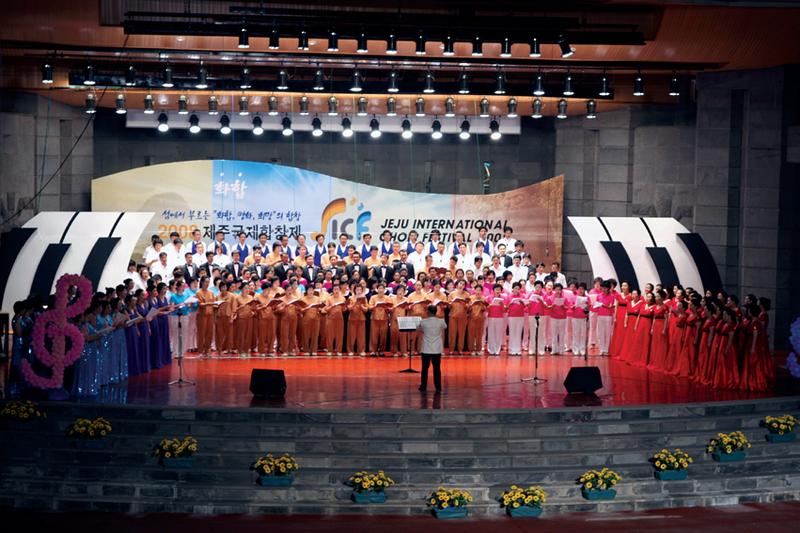 The Jeju International Choir Festival is a non-competitive festival for choirs from all over the world and is held this year from July 15 to 19 in locations around Jeju, in honor of the third anniversary of the inauguration of the Jeju Special Self-Governing Province. The festival, originally established as Tamna National Choir Festival in 2001, has grown to be Jeju International Choir Festival in 2008 with an ambitious goal of blending music into the tourism industry of Jeju Island as well as revitalizing Korean vocal and choral music. This year, more than 2,500 musicians from 60 world-class choirs with a tradition of excellence (9 international choirs, 23 domestic choirs) will visit Jeju island, perform a wide range of repertoires in styles and genres from classical to local pop music, and share a passion for vocal chamber music. Participating choirs include Infinito Singers (Indonesia); Dithyrambic Singers (Malaysia); Vocal Folds 4 (Australia); Vocaldente (Germany) and 13 international and domestic boys and girls choirs. During the festival, choirs will perform an open-air concert at the beach and a guided tour concert in other tourist attractions around the island. Venues include Jeju Culture and Art Center, Jeju-si; Jeju Seaside Art Center, Jeju-si; and Cheonjiyeon Fall Outdoor Stage, Seogwipo where choirs and audiences will enjoy an amazing evening performance and natural beauty in a romantic atmosphere. The festival program consists of the opening and award ceremony, national choir competition, choral performances, and the tour concert. The five-day festival is free of charge, and for the daily program and further information, please visit Web site www.jicf.co.kr (In Korean and English).